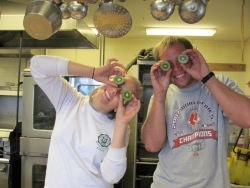 Kiwi Eyes with SML Student Staff! Positions for 2019 are currently full. If you are interested in being added to the waitlist, please fill out the application form at the bottom of the page and contact your academic coordinator. If you have pre-registered for an SML credit course, and would like to apply for a summer student staff job on Appledore Island, please complete the short application below. Join our student staff community! Please include the exact dates that you are available to work. Students can only work before or after (not during) their course(s), meaning that your course dates and employment dates cannot overlap. The recommended minimum employment duration is two weeks. After submitting the student staff application below, an SML staff member will contact you to discuss available work dates. A limited number of summer employment positions will be awarded each summer. Applicants must be an undergraduate or graduating college senior, at least 18 years old, and enrolled in an undergraduate summer course at Shoals Marine Laboratory. (Students enrolled in high school courses are not eligible to be student staff.) Students are not required to have Federal work-study assistance to apply for summer employment with SML. International students: Please let us know about your visa/employment eligibility status when you apply for a student staff position. Only applicants who are already eligible for full-time employment in the U.S. can apply. Curricular Practical Training (CPT) or other comparable programs cannot be used for student staff. Students will work closely with the SML staff to maintain the Appledore Island campus in several ways. Most of the duties will involve kitchen duties and housekeeping. Qualified students will help the SML engineering department maintain the grounds on Appledore Island. Working closely with the SML staff, you’ wil learn first hand what’s required to keep a busy field station operating. Student staff will live on island during their employment and work 6 days/week. $10/hour for a 48 hour work-week. Room & board (housing and all meals) is provided at no cost during employment. Student staff live in a double- or quad-occupancy dorm rooms and eat meals with the entire island community in our dining hall. On scheduled days off, student staff may choose to stay on-island or travel via boat to Portsmouth, NH for the day (at no cost to you). Hiring documentation is required by Federal Law, and must be completed before arrival on Appledore Island. Students will be hired through the University of New Hampshire's HR office. Students that apply before April 1st will be given priority.